From Wikipedia, the free encyclopediaYom Hazikaron (יום הזיכרון לחללי מערכות ישראל ולנפגעי פעולות האיבה‎, lit. Day of Remembrance for Israeli Fallen Soldiers and Victims of Terrorism) is Israel’s official Memorial Day. The national observance was enacted into law in 1963. While Yom Hazikaron has been traditionally dedicated to fallen soldiers, commemoration has now been extended to civilian victims of the ongoing armed dispute. 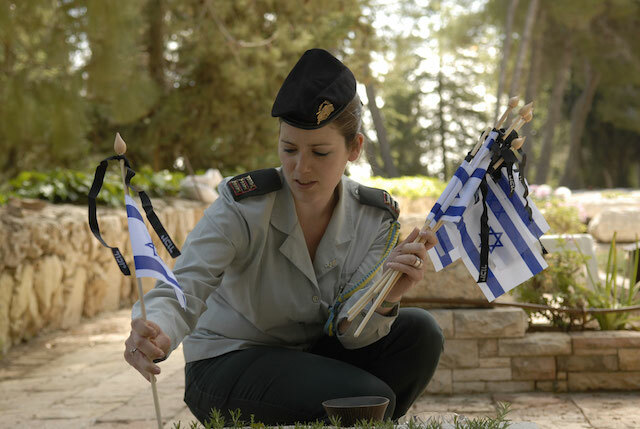 Israel’s Memorial Day, Yom HaZikaron, begins this year on Sunday evening, April 14, 2013. Israel never forgets its debt of eternal gratitude to its sons and daughters who gave their lives for the achievement of the country’s independence and its continued existence. It is a day of collective and personal heartache mingled with awe and honor for our holy martyrs. When looking at Israeli military history, most people consider the Six-Day War of 1967 as Hashem’s greatest miracle of modern times. My choice would be the War of Independence of 1948-49. In the initial stage of the War of Independence, the Egyptian, Syrian, Iraqi and Jordanian armies scored notable successes. It looked like the tiny Jewish nation would be finished before it began its modern-day rebirth. The formidable Egyptian army – backed by tanks, artillery, armor and aircraft, which Israel did not have – were able to cut off the entire Negev and to occupy parts of the land that had been allocated to the Jewish state, reaching as far north as Ashdod. The Jordanian Legion succeeded in defending their key position in Latrun after a bloody aborted attempt by an untrained and inexperienced Israeli assault force that included quite a few Holocaust survivors that had recently arrived in Israel from the deportation camps of Europe. They also overran and captured Gush Etzion. The Iraqis had almost reached the Mediterranean and the Syrians were dangerously near Haifa. Jerusalem, with 100,000 Jews was virtually cut off from the rest of Israel. Hacked to pieces in this way, Israel was not very far from collapse in June of 1948. The Israeli Army then was not much more than new immigrants from Europe and Morocco with a few kibbutznik commanders. Many of the soldiers had no firearms. Some had never shot a rifle and had little idea of what to do in a battle. If a “rare” machine gun broke down or needed assembly, it was necessary to wait for a rare expert to come along who knew how to assemble and repair machine guns. Most of the Israel’s soldiers had had little or no training. Thousands of them were new immigrants rushed off the boats and given guns, most unable to speak Hebrew and understand commands. The Egyptian Army dealt a nasty blow to the Givati brigade in the Battle of Nitzanim, a mile south of Ashdod. It looked like nothing could stop the Egyptians from reaching Tel Aviv; then, the war would be over and so would the State of Israel, Heaven forbid. The morale of the Egyptians was high and the Egyptian press and people were already celebrating. First, they seized Gaza, then Majdal (Ashkelon), then Beersheba and now Nitzanim with Ashdod next on the list. By Egyptian calculations, Israel’s ill-equipped armies and settlements would fall swiftly. Egypt also hoped to reach the Ramle area to link up with the Arab Legion’s forces at Latrun. Such a move would be a mortal blow to the Jewish forces. Yet Hashem had other plans. An Egyptian column of some 500 vehicles was making its way up the Coastal Road towards Tel Aviv. The column was confronted by a bold company of Givati soldiers who had miraculously exploded the sturdy Turkish bridge over the Lachish river at the Southern entrance of Ashdod to delay the Egyptian advance. Barely 20 miles separated the enemy from its objective. With no time to waste before the Egyptians could circumvent the bombed out “Ad Halom” (“up to here” in Hebrew, the northernmost point of the Egyptian thrust into Israel) bridge, Israel tried its first aerial attack. Lou Lenart, an experienced American volunteer, was selected to lead the historic mission. He was joined by Moddy Alon, Ezer Weizman, and Eddie Cohen. Each plane swooped down on the enemy with two 70-kg bombs. They tried to strafe the Egyptian column despite heavy ground fire. Unfortunately, the Messerschmitts’ untested 20 mm cannons and machine guns jammed quickly and the few rounds that they fired didn’t inflict much damage. But the psychological effect was enormous. The surprised Egyptians thought they were being hit by a massive air bombardment. They panicked and scattered all over the adjacent sand dunes. By the time they regrouped, they had lost the offensive. Israel’s outnumbered Givati forces seized the opportunity to launch a counterattack. With Hashem’s loving grace, they stopped the advance in its tracks. The price of success was high: Eddie Cohen, a South African-born pilot, was killed when his Messerschmitt – apparently hit by anti-aircraft fire – crashed and burned trying to land after the mission. As a result, the First Jewish Fighter Squadron lost one-fourth of its aircraft and one-fifth of its pilots on its maiden combat sortie. Eddie Cohen of blessed memory was not the macho type of pilot. Indeed, he was contemplative, calm, scholarly, never daring, and never reckless or adventurous. This anti-hero was the Israeli Air Forces’s first heroic martyr. He merited being Hashem’s emissary in the formidable miracle that turned the tide of Israel’s War of Independence. With an army that wasn’t an army, an air force that wasn’t an air force, and a pilot that preferred classical music and archeology to flying warplanes that weren’t much more than souped-up Piper Cubs, Hashem chose to perform the miracle of Ad-Halom on the outskirts of my beloved hometown of Ashdod. “They have their chariots and they have their horses, but we shall call the Name of Hashem our G-d!” (Psalm 20:8). This day honoring fallen soldiers, immediately precedes Israel’s Independence Day. “Magash Hakesef” (The Silver Platter), a poem written by Nathan Alterman during the 1948 War of Independence, was during the 1950s and ’60s the most common reading for Yom Hazikaron ceremonies. The poem attained a status almost similar to Lincoln’s Gettysburg Address in U.S. culture. During the ’70s, especially following the Six-Day War (June 1967) and the Yom Kippur War (October 1973), numerous new poems and songs commemorating fallen soldiers became popular and often replaced “The Silver Platter” in public ceremonies. “Hare’ut” (“Friendship”), a song composed a year after the 1948 war, had an impressive comeback in the 1980s and ’90s. The late prime minister Yitzhak Rabin considered this poem/song to be his favorite. The historic AFDI pro-freedom campaign that changed the discourse and finally had press, politicians and pundits calling savages savages (not militants, insurgents, resistance blah blah blah). AFDI took a lot of heat, but the truth won out. On Jan. 29, 2004, 11 people lost their lives and 50 were wounded in a suicide bombing on Egged Bus 19 in Jerusalem. Since that tragic incident, the remains of Bus 19 have travelled around the world as a reminder of the horrors of terrorism. First stopping at The Hague for the International Court of Justice hearing regarding the Israeli West Bank barrier, the wreckage was then brought to the United States, where it toured among various cities, college campuses, synagogues, and churches. This flags are flags of the Nazi Youth Organisation “Hitler-Jugend”, regional branch of Palestine. The historical context to the Grand Mufti of Jerusalem, Haj Amin Al-Husseini. Every Israeli will understand this message. Will the Americans understand what we have to go through both as Civilians and in the Military? Just because someone is not in uniform does not mean they are not a target for an Arab Nazi (Fatah, Hamas, Hezbollah ect.) terrorist. The Arabs have always been Nazis and they are still Nazis. This will not stop until Israel either transfers then or goes for Total Victory like the Allies did during World War II. In the Soviet occupation zone, thousands of youths were arrested as “Werwolves”. Evidently, arrests were arbitrary and in part based on denunciations. The arrested boys were either “shot at dawn” or interned in NKVD special camps. with an total “Isolation policy“. This entry was written by Staff, posted on א׳ באייר ה׳תשע״ד (01/05/2014) at 05:36, and filed under Chagim - Holidays, Life in Jerusalem and tagged Yom Hazikaron:.